With 200gpd high capacity membrane!! The PurePro RO202 Reverse Osmosis system uses the most advanced water treatment technology available. Reverse Osmosis is recognized as one of the best available technologies for producing high quality drinking water. 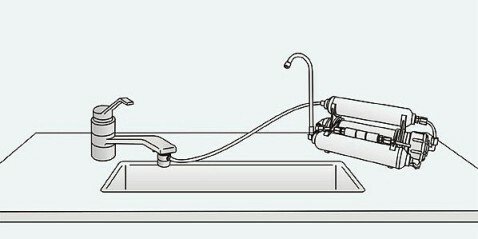 It's also the same method used by many bottled water companies to make safe and great tasting drinking water. The PurePro RO202 Reverse Osmosis system is the only reverse osmosis system that attaches to your faucet and includes carbon filtration. The carbon pre-filter removes chlorine, tastes and odors. 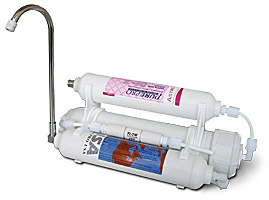 The reverse osmosis membrane in the PurePro RO202 removes nearly all the other contaminants common to tap water. The PurePro RO202 is the most compact reverse osmosis system available. Unlike other small filter systems that require frequent cartridge changes and only remove taste and odors, the PurePro RO202 truly purifies water at the molecular level.